Note 1: This game was played on a NES 101 (Top Loader) console with RF output. Because it is a Famicom (Japanese NES) game, I used a HoneyBee adapter that allows you to play Famicom games on the NES. Note 2: Because this game is an action/adventure RPG that includes a lot of text, I found a translation rom and had a patch inserted so the game’s text would be English. I would have simply had an NES reproduction cartridge made, but that presented the maker with some difficulties because the original game included some uncommon (additional) sound chips that may not have functioned properly in an NES cartridge. This copy of Esper Dream 2 had an English translation patch added, and it was played on an NES Top Loader through a HoneyBee adapter. 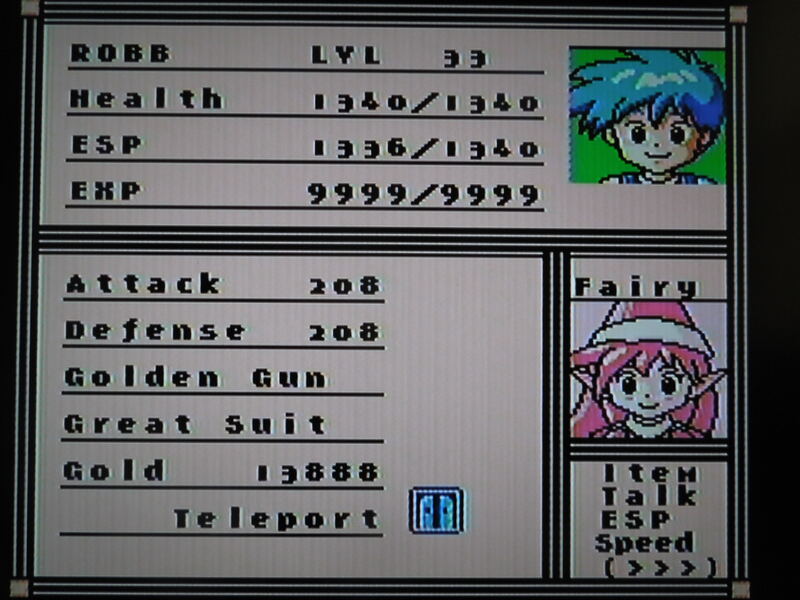 Story: You begin Esper Dream 2 by naming your main character, a boy with bright teal hair. You have up to 4 letters for the name, and the name appears on a ‘library card.’ After naming the boy, the game begins in the Toaru Library, where you go to do some leisure reading. While reading, however, a fairy (aptly named ‘Fairy’) appears and asks you to retrieve the rings of the ‘Book Worlds’ – 5 different worlds reached by standing on the star in front of each numbered book case in the Library. The 5 rings were stolen by monsters, but a greater plot is hinted at and unveiled as the story progresses. 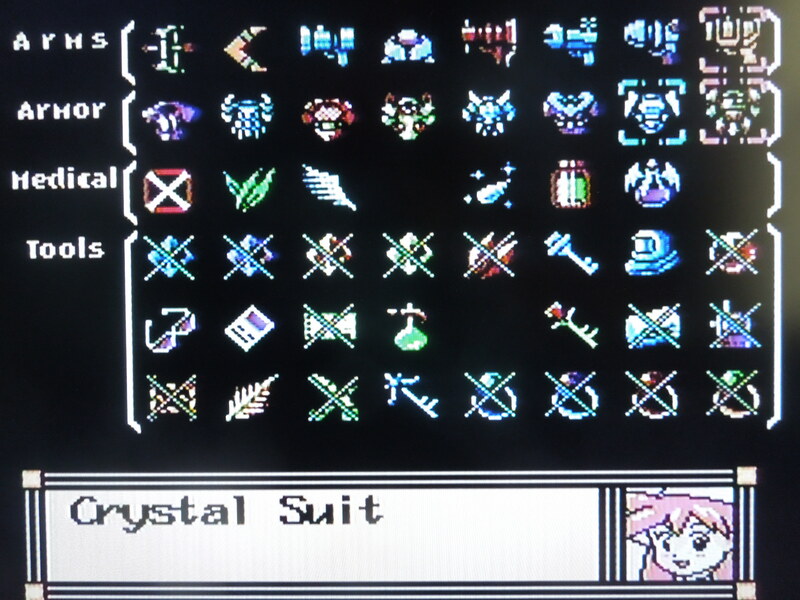 Fairy gives you a ‘Normal Suit’ and a ‘Fairy Bow’ to start the game, and off you go to BookCase 1! It’s up to you to recover the 5 Rings and save the Book Worlds! Control: The A button, in fighting situations, fires your bow or gun, of which you have unlimited fire. The B button, in fighting situations, uses your ESP powers (spells), and drains your meter based on the level of the spell. The Select button cycles through your ESP powers (spells), and the Start button pulls up the main menu where you can equip weapons and armor, use items like Herbs to heal, talk to the Fairy for advice on what to do next, look at your ESP spells, and even change the speed at which your character moves. The Start menu gives you a variety of options. BookCase Worlds: Each World begins in a Town (except for BookCase 2, which begins on a Space Train), where you’ll get some basic info from the locals about monsters nearby causing trouble. In each World, you’ll shop, fight monsters, and go on linear fetch quests to progress the story towards finding the monster who has stolen the ring in each world. Helpers: Soon after you arrive in each World and snoop around a bit, you’ll be joined by someone from the town, whose main benefit is to assist you in battle. You encounter enemies by making contact with small, moving footprints in each world – when you touch them, the game switches to a ‘battle screen,’ where you can choose to fight the enemy or simply walk off the screen or use Teleport to escape. Your computer partner will follow directly behind your character when not in battle. When in battle, unlike you, your partner cannot be harmed whatsoever by enemies, and his or her attacks are actually quite handy in battle. You’ll have no control over them during battle, however, as they are completely AI controlled. Two of the helpers are human – Lisa and The (train) Conducter, Aram, and two are quite bizarre – a talking Screw and a talking Star! You’ll have a helper in each world to accompany you and help you in battle. Experience Points: With each individual monster that you kill, you’ll build experience. 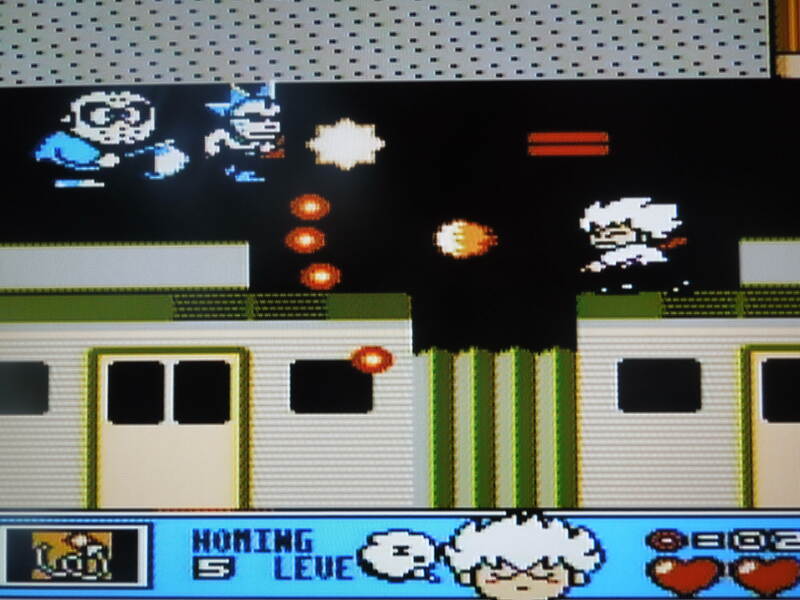 After you gain enough points, you’ll ‘Level Up,’ and your Life Bar (H.P.) and Magic Bar (E.P.) will extend. Additionally, your Attack and Defense stats will increase marginally. Most battles are quick, and leveling up happens often. Once you get to Level 33, however, you’ll be maxed out at 1,340 E.P. and 9,999 H.P. Music: The music in Esper Dream 2 is excellent. Each BookCase World has a different song, and they are extremely well composed. The game uses the Konami VRC6 chip, which was supposed to add an extra music channel for better music than other games. Honestly, I’m not a technical expert when it comes to games (I just enjoy playing), and I have no idea if that ‘extra channel’ of music is working the way I have the game hooked up (to a HoneyBee adapter plugged into an NES 101), or if you need to play the game on a Famicom in order to get the extra music, but what I do hear is outstanding. You’ll find (or buy) all kinds of weapons, armor, healing items, and other objects throughout your quest. Only 4 Levels? Yes. 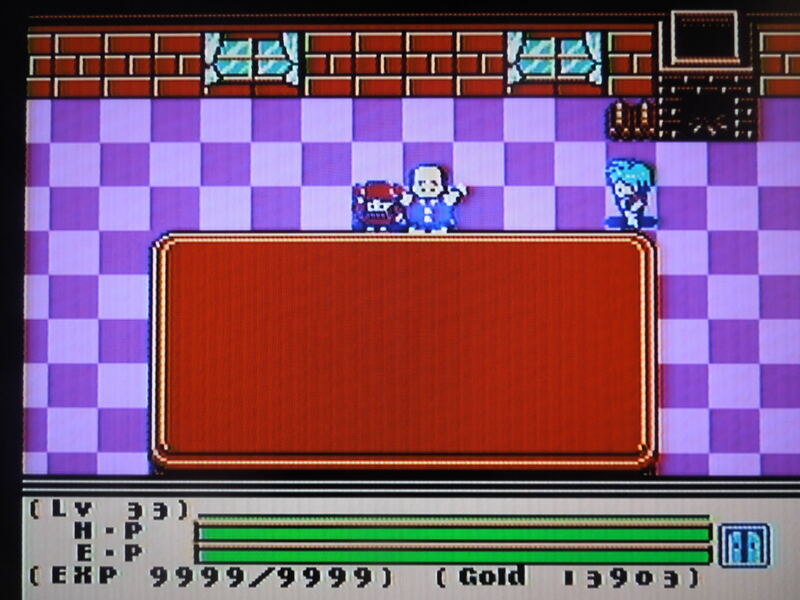 BookCase 3 is simply one room with a couple of characters in it from the original Esper Dream that was released for the Famicom Disk System. 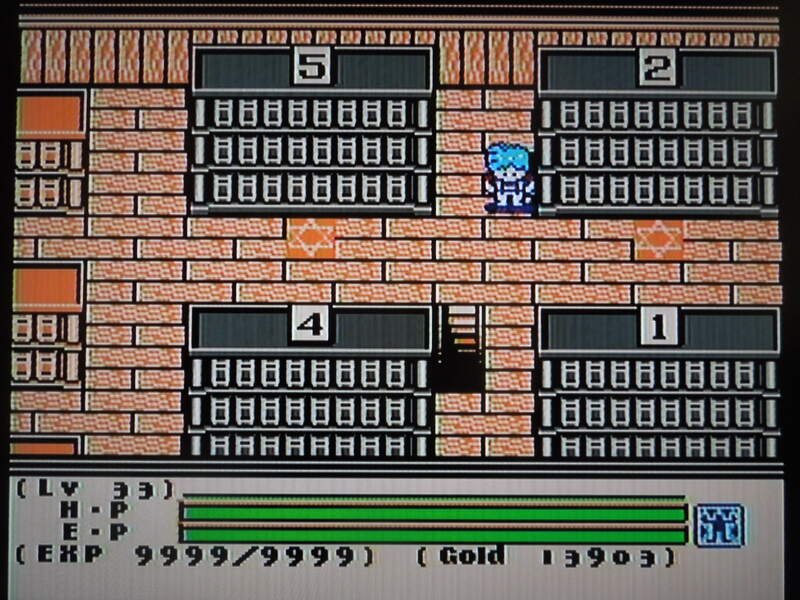 Prior to entering, a strange character (who is actually the protagonist from the original game) will appear in front of the bookcase and give you the ring and armor from that world. He claims to have ‘done all the work for you.’ While this is neat if you have played the first game and are familiar with these characters, I wish it would have been a proper world, as the entire game plays on the short side. Technically, you do have to actually battle through 5 Worlds even without a World 3, because after completing World 5, a staircase opens up in the Library that you have to enter. It’s not a proper ‘World,’ but it does contain previous bosses and of course the final boss. BookCase World 3 is nothing more than a single screen with characters from the first game (and some great music). 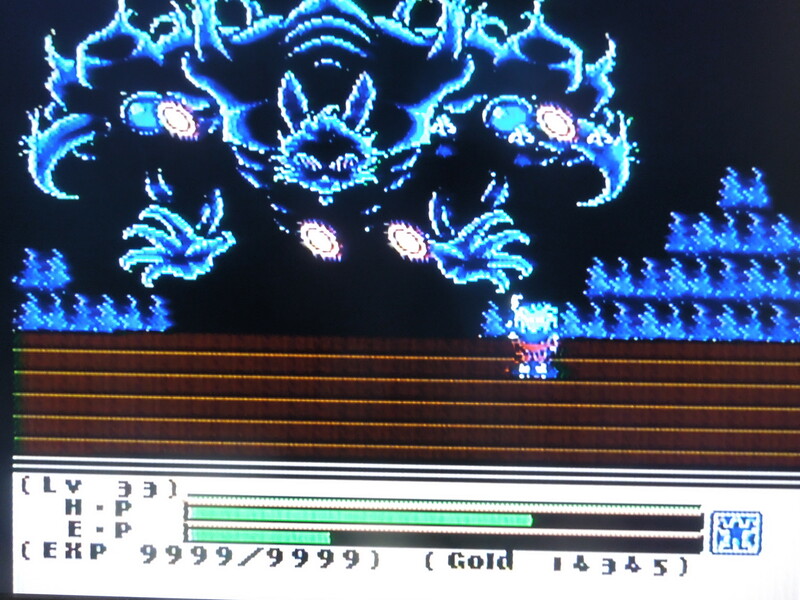 Difficulty: The difficulty of the game usually hinges on the boss fights. While the first couple of Worlds and boss fights are easy, the latter few are certainly tough – you need to be properly leveled up and sometimes have to try a variety of attacks before beating bosses. Additionally, you’ll mostly breeze right through World 1 and World 2, but for World 4 and World 5, you’ll have a lot of exploring and backtracking to do, and you may get lost a few times before you figure things out. Saving: The game saves your progress. You can use the Teleport spell at any time to return to the Library, where you record your progress in the open book. The game has two save slots, by the way. The boss fights, particularly the last one, are awesome, but they may take a few tries if you’re not prepared. 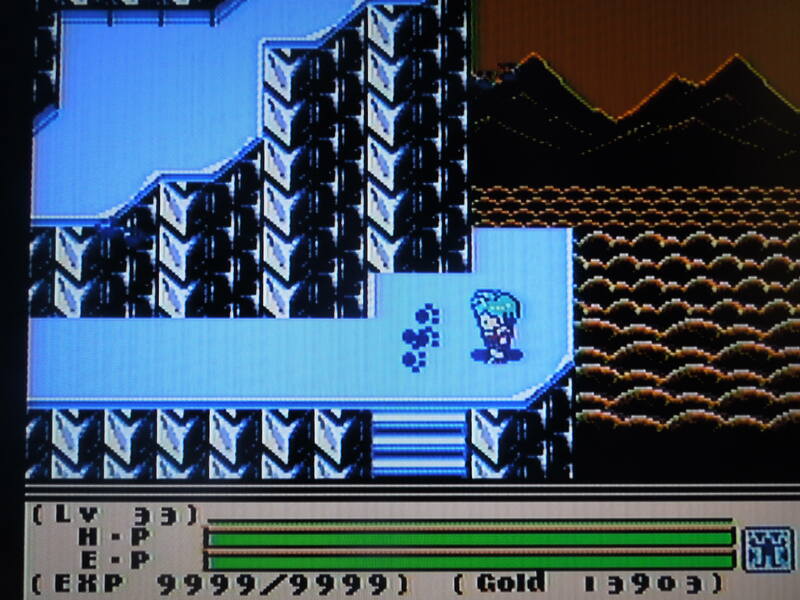 Conclusion: Esper Dream 2 is an outstanding NES/Famicom game. 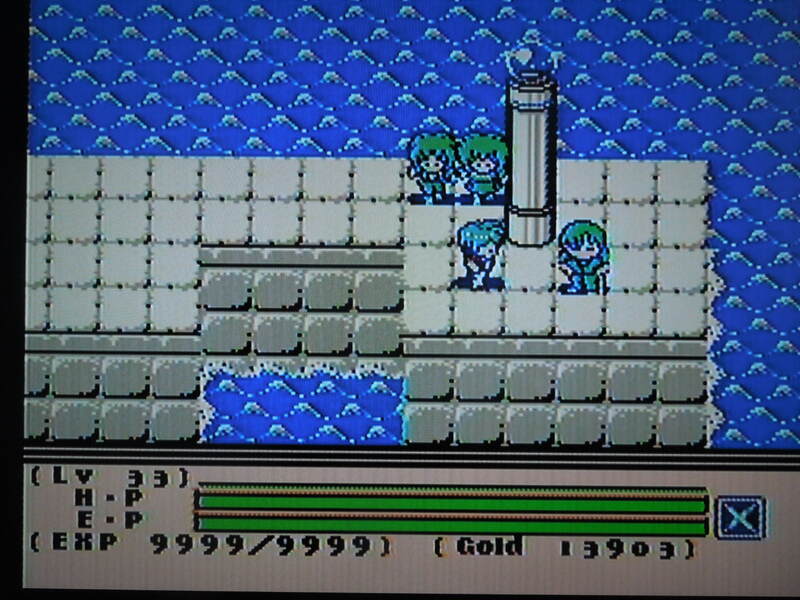 I like that it’s of the action/adventure variety, rather than a turn-based RPG like many other NES games of this ilk. The story, with the ‘Book Worlds’ and ‘ESP’ themes, is quite different from anything I’ve played before on the NES. A minor gripe I have with the game is the underdevelopment of the characters and explanation of just what is going on at all times. The translation itself is wonderful – not a grammatical error to be found – and I always knew where I was supposed to go – but the story never really explained WHY all this was happening clearly, and certain characters’ motivations were a bit of an unsolved mystery. Still, I was captivated throughout, and the 4 BookCase Worlds were each unique and fun to explore. The Southern Gentleman’s Opinion and Letter Grade: A It’s a shame this never had a U.S. release, because this is one terrific game. I wouldn’t recommend playing it without the English translation, though. Level Up, Level Up, Level Up – It’s easy to do, and you’ll be glad you had a longer health bar and more ESP Power later on – trust me. STAY STOCKED UP ON HEALTH ITEMS AT ALL TIMES – Herbs (200 Health Restored), Angel Wings (200 EP Retored), then the additional items that restore 400 Health or 400 EP then later All Health Restored (Strength Origin) or All EP Restored. You’ll be glad you did in BookCase Worlds 4 and 5, particularly for the bosses. LEARN THE ESP (by leveling up) spells and USE them. 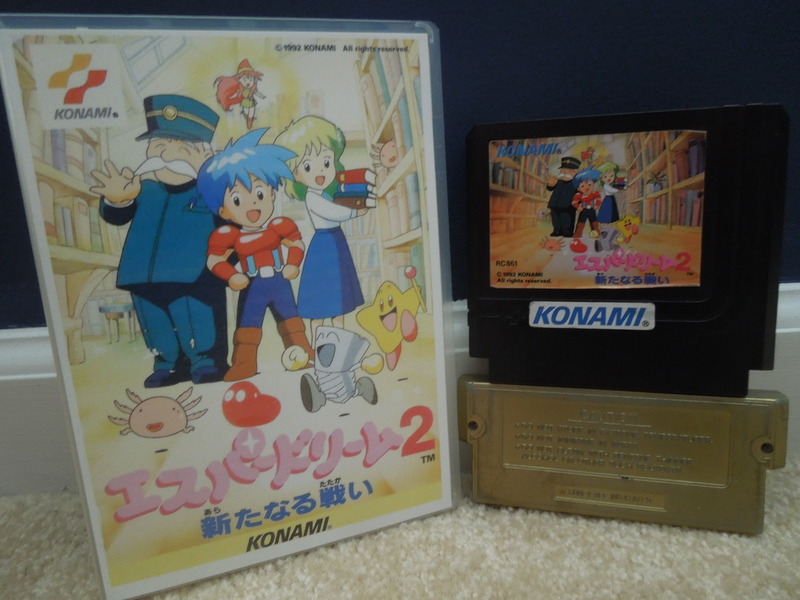 This entry was posted in Famicom - Esper Dream 2 and tagged Esper Dream 2 Famicom Review. Bookmark the permalink.